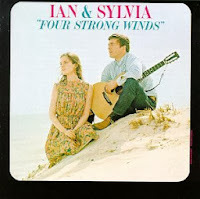 Ian & Sylvia's second album followed much the same formula as their first - traditional folk material sung in harmony with minimal acoustic accompaniment. However it was notable for the inclusion of two specific songs. The first, "Tomorrow Is A Long Time", was an early Bob Dylan composition which he had not released himself (and would not until it was included on 1971's Bob Dylan's Greatest Hits Volume II). Ian & Sylvia's version here was the first released recording of this song. The title track of the album was an Ian Tyson original, and has come to be considered his signature song and a classic in its own right. Bobby Bare had a #3 country hit with it in the same year. First, thanks for Ian & Sylvia 'Four Strong Winds' and many albums from your past blog.This album is much stronger than the debut album.Folk definitely had a big place in music during that era.Your efforts are appreciated! Many thanks for this. I've been missing this since the 1960s.